If you are not receiving a pay cheque showing income tax deductions, the chances are that you are building up a hefty income tax bill. There is an increasingly common practice among certain small businesses, particularly within the construction sector, where they pay employees directly with a cheque or bank transfer, without first deducting tax contributions. This is entirely legal, however, employees are often left in the dark when it comes to their tax responsibilities, therefore not putting aside a percentage of their pay cheque to cover their income tax at the end of the year. Unfortunately, we have seen this scenario on a number of occasions, where workers have unwittingly been left with a large income tax bill. This can often coincide with the expensive process of applying for permanent residency in Canada, leaving them in a tough spot. Here are some tips to help avoid being stuck with a hefty income tax bill, if you are being paid on a contractor or self-employed basis. If you are unsure whether you are being paid on a contractor / self-employed basis, the first thing is to find out. You can ask your employer directly, or the more reliable method is to request your detailed pay stub or summary of earnings. On this it should outline your income tax contributions, along with CPP, EI and other potential contributions, such as union dues. If you’re still unsure, drop us a message and we can help provide assistance. If you discover that you are being paid as a contractor, you can request that your employer pays you through payroll, with income tax, CPP and EI starting to automatically be deducted from your pay cheques. If your employer refuses to switch you to being paid through the method above, or you wish to remain on a contractor and self-employed basis, you can prepare for your tax bill by putting away a certain percentage of your earnings into a savings account. Alternatively, feel free to contact us and we can help provide guidance on the amount of money you should be saving for your income tax bill. One of the benefits of being on a contractor / self-employed basis, is that it allows you to claim on a number of expenses, which you wouldn’t have been able to as a normal payroll employee. This can drastically reduce your taxable earnings, meaning less tax for you to pay. There is a huge variety of expenses that can be claimed, such as vehicle use, phone bills and a certain portion of rent and hydro. Finally, don’t forget to hold onto your receipts, as CRA can audit your tax return at any time. If you are claiming expenses for a new car or laptop that you have bought, for example, ensure you keep the receipts to help lower your income tax bill. For more information on contractor and self-employed tax returns drop us an email, we’re more than happy to help. Are you earning money in Canada as an actor? If so, you are likely being paid on a self-employed basis, in which case you are required to fill in a self-employed tax return. One of the most important and useful money saying tax tips is claiming on work space in the home, as part of your expenses as an actor. While this isn’t applicable for everyone, depending on your circumstances, it potentially allows you to claim back part of your living expenses, such as rent, electricity, insurance and a number of other costs. Ensuring you cover all of your work space expenses is crucial in getting the lowest tax bill possible, or you could miss out on potentially hundreds or thousands in unclaimed expenses. As an actor, you are likely to get around the place, figuratively. Therefore, ensuring you are claiming back your permitted motor vehicle expenses can help massively reduce your tax bill. You can claim back on a whole host of motor vehicle expenses, such as insurance, repairs and even fuel costs that were used for work-related purposes. A drivers log is an essential item to keep maintained for this expense claim, so speak to us and we can help advise how to create and maintain one, as this is a regular area where CRA will audit your return. One of the easily missed expenses, though hugely important for reducing your tax bill, is capital cost allowance, particularly carrying over prior years assets to the current year’s tax return. Assets that were purchased for work-related reasons can be claimed back on your tax return for the entire duration of the asset’s financial lifespan. This is often missed or forgotten when lodging tax returns, though can make a huge different to the overall amount of tax you are required to pay. If you purchased a laptop, for example, this can be claimed back on each subsequent years’ tax return, as long as the depreciation is correctly considered and applied. If you are unsure on how or what you can apply to your tax return, or whether you are getting the most out of your situation, why not get in contact for a free consultation with one of the team at JacksTaxBack.com today. 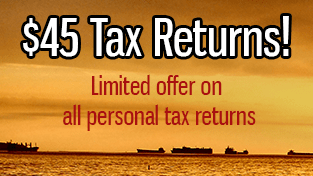 Our self-employed tax returns are completed for a flat $150 fee, with no hidden charges or additional fees. Tax doesn’t have to be a taxing experience, after all. Here is Jonathon Thomas from the JacksTaxBack.com team showing you how to easily claim your Canadian tax return in three easy steps. Even those of you on an international experience Canada visa are eligible to apply for their tax back, so why not get in contact for a free quote today. Are you ready for the new tax return season? Tax season is just around the corner, but are you ready to file your Canadian tax return for 2016? Filing your tax return, especially if you are a student, overseas or temporary worker in Canada can be a daunting process at first, though it’s really quite simple. Here is how to get yourself through tax season in these three easy steps. Employers are obligated to provide your T4 (which is a summary of your earnings) at the end of February, though many of them will provide it before this date, especially if you request it. You will need a T4 from every job that you worked during 2016. In either scanning or taking a photo of your T4 (or T4s), email this through to us and we can get a free tax return quote to you right away. We also request that you provide the dates you entered or exited Canada (if applicable), as this can significantly affect your return. Once you have sent a photo or scan of your T4 (or T4s) to one of our team, they will be in touch shortly to complete the tax return process. This includes adding any tax credits you qualify for, while also seeing if you are eligible to claim a number of different expenses, such as transit fares and medical costs. Once we have all of the necessary information, we can file your return within 24 hours at our flat rate of $40. No hidden fees or nasty surprises. How is that for service? Tax doesn’t have to be taxing, after all. Happy tax season from the JacksTaxBack team – we hope to hear from you soon. JacksTaxBack are pleased to announce our official partnership with the fine folk over at Whister Lotto. If you are living in Whistler and want to support some fantastic organizations, while also having the chance to win a cash jackpot or free tax return, then check out Whistler Lotto. It only costs a toonie to enter, and if you aren’t fortunate enough to win the first prize cash draw then you may be luckier with second prize, which is a free personal tax return and two 50% vouchers to pass on to friends and family. The draws are every Tuesday at 6pm, with a couple of different locations available in Whistler where you can enter. We look forward to helping Whistler Lotto and their charitable partners continue doing great work in the community. For more information, check out the Whistler Lotto for more details. Returned home from Canada? The good news is that you can still file a tax return, even from outside of the country. If you have returned home from Canada and not claimed your tax back for 2015, or any year that you worked during your time in the country, then the chances are that you are due a large tax rebate. Filing is simple and only requires a copy or photo of a T4 from each job that you held. T4s can be obtained by contacting your employer, so send them over to us once you have them and we’ll get you a free quote. If you like the quote then we will file for $40. How is easy is that? Our average tax return for 2015 was $800, so make sure you don’t miss out on any money that is owed to you. Tax doesn’t have to be taxing, so get in contact with us today!